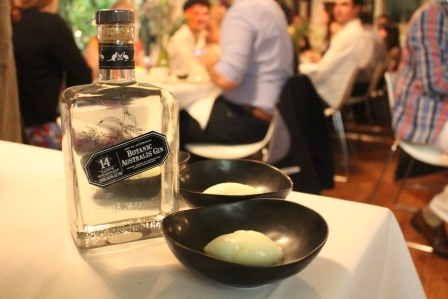 This ground breaking evening showcased the versatility and complexity of Australian gin in style. Initially set-up by craft spirit distributors Nip of Courage (whose photos are featured here- thanks!) 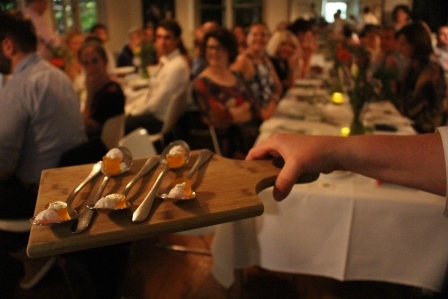 , it became a sold out evening as part of Canberra’s Good Food Month. Leading up to the event I liaised with the restaurant virtually, but we didn’t get to meet in the real world until a few hours before service and were able to make any last minute refinements to the recipes. For example, I had planned to use regular Noilly Prat dry vermouth in the Martinis on arrival, but the restauranted wanted to use all Australian ingredients, so I had to use the excellent but complex Maidenii which needs careful handling in a Martini as its an acquired taste and can dominate a gin, especially a mild mannered McHenry + Sons. Plus I was mindful that many of the people coming would be new to all of the above, so I had to whisper up a ratio that would be both elegant and still a crowd pleaser. 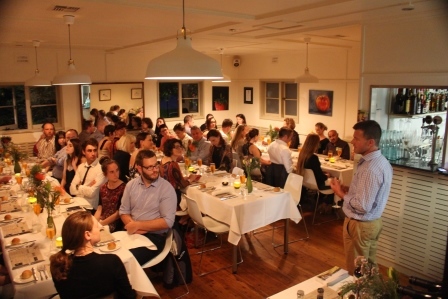 Over 50 people from a diverse background came along to have their horizon’s expanded, most had never had an Australian Gin before, let along in the context of cocktails matched to cuisine so carefully. There were more people who wanted to come, so obviously we struck a chord and I hope we can do it again! Gin was either the accompaniment or an key ingredient in the dish and you can view the menu for the evening here: Ginner_Dinner_Web PDF. The restaurant team worked hard to think through the possibilities of each gin flavour profile in a dish, or in a cocktail referencing say the earthiness of the Sloe Gin as a starting point and looking to match it with equally intense venison and beetroot flavours. The following recipes are courtesy of the team at Pod Food developed with some refinements by yours truly. On arrival guests received a dry Martini mixed by myself and some finger food designed to compliment with savoury flavours the sharpness of the spirits. I then gave quick introduction to Martini’s and demonstrated how they can do it at home, providing a handy Martini Handout. It was a testament to the experienced professionalism of both floor + kitchen that this evening with lots of moving parts both drinks, speakers and food went off without a hitch. Pour over either a single plumb green olive, or fresh sprig of Thyme in a chilled glass. Note: you’re aiming for a very pale pink in colour from the Vermouth to show you’re doing the mix right, else it dominate the Gin overly. 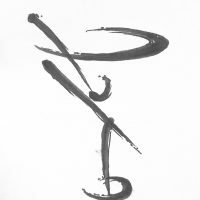 Less is more here. The McHenry is a mild-mannered Australian Gin, akin to Tanqueray but softer, so don’t let the Vermouth dominate. Alternately if using a regular dry Vermouth like Noilly Prat, then you can afford to be more generous in the dose if that’s your preference. Note: this is a no-brainer to make and a summery alternative to a Campari soda without the bitterness, and you still get hints of lime from the Stone Pine gin. Put ingredients, plus crushed ice into cocktail mixer and shake well. Strain over crushed ice and garnish with blackberries and raspberries. Note: This was a real hit and surprisingly complex with the Sloe Gin anchoring the cocktail with savoury notes and still being refreshing without overt sweetness. The dinner ticked over at a steady pace with a new course each half-hour and a new cocktail to match, these were introduced by myself and I gave the audience the background about each Gin in turn and how the cocktails were made. We kept the tone light and fun. 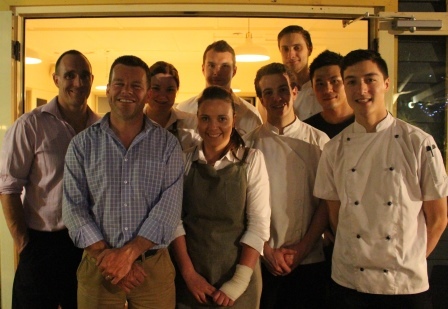 We were also fortunate to have Ian Glen the distiller from Stone Pine present to talk about the craft as well. Although biased, I have to say that the execution of both the drinks and meals really impressed the guests. We were aiming for both a quality expression of the spirit without being gimmicky, as well as demonstrating how versatile a spirit Gin is. 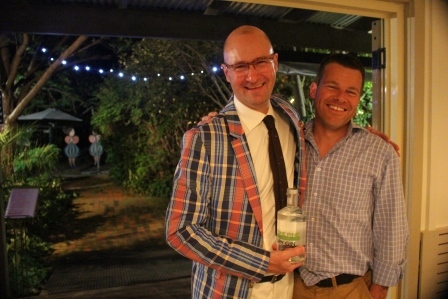 You can see photos of the evening on the Martini Whisperer facebook page here plus on the Canberra Times website. 1 part chilled Ear Grey tea syrup (make by reducing tea with sugar in equal parts over a low heat then cool. Pour ingredients over ice into a glass and top with soda and garnish. Note: Gin in a tea cup! You want balance of equal flavours here, so don’t let the lemon dominate. Pour gin over ice and add sliced cucumber, add cordial and more ice and top with soda, then garnish with fresh mint. Note: This Gin is really busy with lots of flavours and complexity, so this is a great way to try it as you get all sorts of tastes at the end and still refreshing summer drink to rival a regular G+T. Disclaimer: I was commissioned + paid for my services to help design + host this event. The perfect note to finish on: gin and grapefruit jubes! All the YES for this Phillip, what an amazing event. Cant wait to try the Elderflower Cooler. Yarm! Thanks Anna! Its a no-brainer to make and absolutely de-lish!